The forecast showed sun symbols across the country so, envisaging a Sunday of sunny cycling, I opted for cycling shorts. We pedaled out of the car park at Loch Achray following the Dukes Pass. As we dropped into Aberfoyle there were a few tantilising sunny spells. On the road that passes Lochs Ard and Chon the sunshine gave in and was replaced by cloud. By Stronachlachar it was drizzling and once we were well on the way to the westerly point of Loch Katerine we were getting drenched. The route round the loch was paved all the way with occasional notice boards explaining points of interest. With the wind at our backs we rolled along the undulating road. Views of Ben Lomond and the Arrachar Alps are supposed to be great but we saw sod all as the cloud dropped. The midges started biting too! Oh well, the pub at the big car park served us up fish and chips and with happy tummies we pedaled back to the car. Having spent four days cycling the coast to coast route, and then driving up to Edinburgh, Alastair sat at my dining room table and looked at the map. It was an ambitious plan. We arrived at Cluanie Inn at about midnight and found some woods to stash a load of food, then we continued towards Shiel Bridge. Finding a lay-by we laid out our mats and sleeping bags in the back of the VW people carrier (seats removed) and slept like logs. Wednesday began with porridge, tea and rain showers. 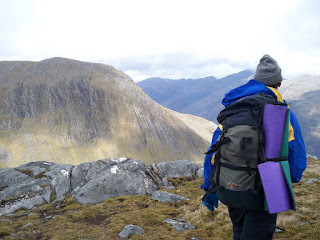 We set off up Meallan Odhar and then on to the Forcan Ridge. Despite the continuing showers we scrambled along the crest, resisting the temptation of the path on the right hand side which avoided the difficulties. Only when we reached a steep down climb did we opt for a steep muddy gully instead. With a few more short sections of scrambling on the route we topped The Saddle and dropped down into Bealach Coire Mhaligain and then walked up the path to Munro number two: Sgurr na Sgine. My poor map reading was to blame for a choice to go down of this peak via a dodgy NW ridge, whilst the GPS wanted us to go over the edge of a vertical cliff. The prudent choice in hindsight is to head south at first and then cut back to the bealach. Four peaks later (and only two Munros), E along the South Glen Shiel, we passed Sgurr an Lochainn and looked at the lochan. It looked a bit far down. Seeming a waste to loose any height unnecessarily we looked for a spot of flat ground for a campsite. This proved difficult and led us to drop towards the lochan. 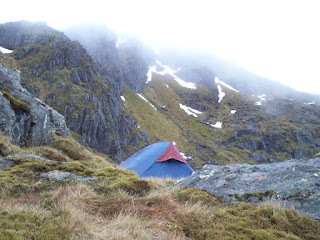 We eventually found a precarious spot that was not too boggy and got in the tent just in time to avoid another shower. We cooked up some cous cous and some bush tea and were asleep by 8:30pm. We woke on Thursday to rain on the flysheet, we ate maltloaf and waited. When the deluge turned to drizzle and then petered out, I brewed up another bush tea and we packed up the soggy tent and got going. With little respite from the rain we headed east and bagged munros. At the last, Creag Mhaim, the sun popped out for a moment or two. We dropped down a track and followed it to Cluanie Inn. At this point our plan had been to take on the Chralaig-Mullach ridge, stay at the Camban Bothy and then hike back to the car via some of the hills on the north of Glen Shiel. Disillusioned by the weather, fatigue but mostly, I suspect, the fact that we had forgot to stash the wine, Alastair hitched back to fetch the car. We regrouped, got a coffee in the Inn, found the stash, ditched the wet tent, packed two bottles of wine and set off along the track on An Caorann Mor. The track became path and the path faded out into a bog. We hopped over the river on stepping stones and contoured on drier ground on the side of Ciste Dubh. Spotting the bothy in the vast glen where three large burns converge to form the River Affric, we headed back into the bog and looked doubtfully at our next river crossing. There was nothing else for it, boots and socks had to come off and we waded across barefoot. Sadly there was no fuel supply at the bothy, and vain attempts to light a few lumps of charcoal with the gas stove didn't manage to dry out my socks. The bothy was warm enough anyway and the best accommodation yet. We drank wine, ate noodles, custard and bananas and slept. Friday started in a familar manner, rain. We tidied the bothy a bit, made porridge, drank tea and headed along the track towards the youth hostel. At some point we decided to veer off across a bog. We then had to recross the river. Al got his feet wet again but, with a few lucky leaps, I managed to hop across a couple of boulders. 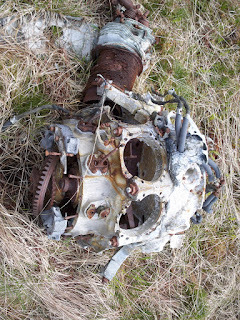 Then we came across a few bits of metal. Then we came across a few more. Then we came across a crash site. (Later uncle google didn't disappoint). The ridge from Mullach to A Cralaig was much better than I was expecting, and so was the weather. The sun came out and my jacket, and then my fleece went in the sack. Being on the hill in a t-shirt doesn't happen too often and I was happy to get a touch of sunburn too! Some more weekend trips on the bike. Living in Edinburgh there is always the temptation to get in the car, or on a train, and head for the highlands. But why not start your cycling weekend from home? One option is to head off over the Lammermuir Hills and spend the night somewhere around Duns or Berwick-upon-Tweed. There are several landrover tracks that could be used for a hilly route. Also there are two scenic roads worth incorporating in your weekend. The first, from Gifford, follows the B6355 till you reach NT599629, then turns left up a steep hill. Keep following the road over several more climbs and decents. The moorland is reminiscent of Devon or Yorkshire and eventually spits you out down a long decent into Longformacus. From here the best of the scenery is over apart from passing the nicely shaped Dirrington Great Law. The second stretch of road, on the way back perhaps, runs beside Whiteadder Water from Ellem Lodge (NT708595) right up to the Dam. Then after a short sharp hill a panorama unfolds of the Whiteadder Reservoir and the shapely hills around. Shortly after passing the tail of the reservoir, turn right (NT654602) and continue to follow the younger Whiteadder Water up into pleasant heather hills. Off the bike, a stone circle (NT626655), an iron age hill fort (NT622671) and Nunraw Abbey provide interest until you roll up in the pleasant village of Garvald. This is a rewarding trip but you need to be prepared to push your bike over boggy ground for about a mile or so and cross some largish rivers without bridges. The rest of the route is on land rover tracks, quiet single track roads, and then a quick nip along the A86. Saturday begins with a rid along Lochan na Earba and Loch Laggan, passing the house where Monarch of the Glen was filmed, and then climbing a pass into Glen Shirra. From Glenshirra Lodge you follow a good paved single track road further than the OS map suggests, up to the woods at NN478958. Opposite here there is a bothy shaped building, but the Melgarve Bothy is further along a land rover track over a bridge and near a farm building. Get some food and some rest, you'll need energy for Sunday. The path marked on the map is a fairly muddy land rover track as far as the recently renovated Shesgnan. From here to the Luib Chonnal Bothy you will have to push for most of the way. The track virtually disappears for the first boggy section to the ruins near the Shesgnan Burn. Cross this and pick up the path which contours the side of Meall Clach a Cheannaiche giving a pleasant aspect for Loch Spey. Riding in fits and starts you'll make it to Luib Chonnal in time for brunch! From here there is a good surface all the way, first on a land rover track along the Roy to Brae Roy Lodge, and then a single track road through the lush Glen Roy to Roybridge. Look out for the parallel roads, a feature caused by an ancient glacial lake. Makes for a nicely alliterative title but its only an extra hour or so to cycle back to Edinburgh. Get the train to Dunkeld and follow the national cycle network route 77 to Dundee. We stayed with friends but there are hostels and camping options too. From Dundee back to Edinburgh there are a number of route choices across the quiet back roads of Fife. Be sure to include a view of the north side of the Lomond Hills and past Loch Leven. We also particularly enjoyed the climb up to Loch Glow following NCN1. The Gaick is a mountain pass that has been in use for many hundreds of years. Its a good day out on a bike mainly on land rover tracks and single track paved roads. There is a section beside Loch An Duin where only confident mountain biking gods will manage to cycle which is followed by a short stretch in a muddy bog where even gods will be forced to push. There are also a few largish rivers to be crossed. The highlights of the route are the three scenic lochs and the imposing mountains around you. Look out for the ruins of the bothy where the Black Officer was killed by a massive avalanche in 1800 (here NN758836). From the Dam of Loch an t-Seilich there is a paved road all the way to Kingussie. Its worth checking out the Ruthven Barracks (NN780993). NCN7 is an option for the way back, often following General Wade's Military Road. Under an assumed name I battled my way along the snow covered ridge to the summit of Ben Lomond. The sleet and wind in my face combined to have the effect of someone machine-gunning me with frozen peas. At the summit a marshal, dressed like an arctic explorer, proffered some Jelly Babies and took down my race number. A loop round the cairn and then, with the wind now at my back, I carefully descended the rocky ridge before going for it on the stony path. 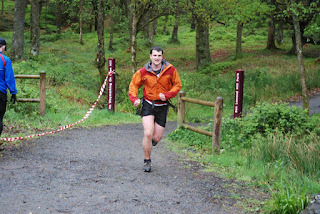 The Ben Lomond hill race was an exciting experience, and one that I would have missed if it wasn't for a chance meeting with John from the running club (CAAC) last week at Moy. He couldn't make the race, although he had entered, so I took his place and his name and ran as John O'Hara. John had also organised a lift with his friend Tommy, which I was also able to transfer my way. Tommy, his brother-in-law Malcolm and Martin Hulme all passed me on the way up but I was satisfied to overtake Malcolm at least on the descent. Martin was the 3rd SV. At the fast end, there was some intrigue because an American trail runner had entered and no one knew what he could do. He set off at the start at a crazy fast pace. He has a great all-American name too: Judson Cake. In the end Brian Marshal, from HELP, caught up and overtook, but the contender hung on for a dead-heat mudslide finish. All made for an entertaining organiser's report. I was happy to get through the race with no pain from shin splints. Nevertheless, after the race, in sunshine (! ), I joined a few other nutters cooling their legs off in the loch and then got a bowl of soup in the hotel. Martin mentioned that he was heading to Arran with Ptarmigan Mountaineering Club, and that there was still space on the bus. The club is based around a bus trip to the hills on the first Sunday of each month. Unless you have an irrational fear of coaches (bustophobia?!) its a great idea, and I'd been meaning to come along since Martin told me about it months ago. The three most pertinent advantages as I see them are these. 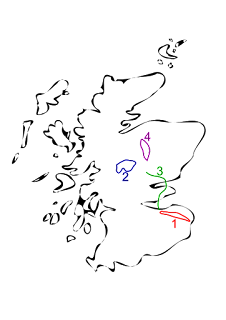 1) A-to-B walks are possible by picking up the bus at different points. So you are not limited to circular walks to get back to the car. 2) You can read a book, or sleep on the journey. 3) After the walk you can have a beer. The forecast was for a bright sunny day, so when the ferry arrived it was, of course, raining. Nevertheless, we caught a bus to Sannox and headed of up the glen. We cut up right onto the steep heathery end of Suidhe Fhearghas, tough work. Fortunately, fuelled the cup of tea and bacon sarnie on the ferry, we made short work of the climb. Just in time for another rain shower as we waited for the rest of our party to catch up. The view of the peaks and ridges opened up with Goatfell towering over the rest but outclassed by the shapely Chir Mhor. Along the ridge on the way to Caisteal Abhail there were several granite boulder pinnacles. 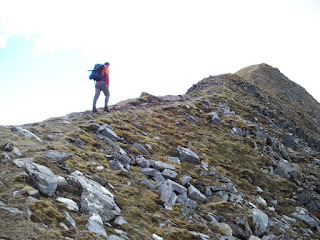 One of these is followed by a sharply cut bealach called Ceum na Caillich or The Witches Step. Peering over the edge at a precipitous drop, we scrambled down a less ardous alternative. With views over the Firth of Clyde, Islay, Jura, Kintyre and Bute surrounding us, not to mention down Glen Sannox and Glen Rosa, we took stock at the summit of Caisteal Abhail. With time (and ferries) waiting for no man, we needed to make a decision whether to attempt the A-chir ridge or drop down to Glen Rosa. 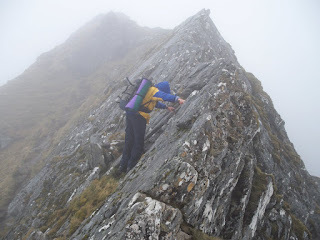 Whichever, first we had to go up the absurdly pointy Chir Mhor, Martin called it "the Matterhorn of Arran". We met a photographer catching, no doubt, beautiful shots of peaks hidden behind wispy clouds. Pity he was stood on the best one. At the turn off for the Glen Rosa path we shunned the easy way and headed off to have a look at the ridge. Initially the scrambling was fairly straight-forward, but it became a little slippery and exposed as we approached the bad step. This, a rock climb, was dripping wet and we skirted around it. Following Beinn a Chliabhan, we dropped, as Dave put it, "at warp factor 10" to the bridge over Glen Rosa Water. Here we met up with a group of Spanish people in the club y he tratado de practicar mi español con ellos. Back in Brodick we had time before the ferry for a swift Arran Sunrise in the pub. I came up with a plan for a weekend of cycling using tracks as far as possible and staying overnight in the Melgarve Bothy. We made a late start as I needed 3 new tyres fitted to the car, so at 4pm on Saturday we parked at Moy and cycled south across the River Spean. We then contoured around Beinnen Shuas and followed Lochan na h-Earba to the the forest and then down hill to Ardverikie House (where Monarch of the Glen was filmed). We then followed the drive way along the banks of Loch Laggan past a sandy beach and the pretty gate house (Magda likes this better than the big house). Crossing the A86 we took a track by Aberarder Lodge that climbed steeply into Glen Shirra and then coasted down to Loch Crunachdan. We followed a quiet road all the way to Melgarve where there were some ruins, one of General Wade's bridges, and the bothy. We woke up a bit cold and were keen to get moving. We packed up and set off into drizzle. I had my doubts about the path we were going to follow parallel with the River Spey to Luib-Chonnal. At first my apprehensions were proved unfounded as we followed a well made land-rover track as far as Shesgnan. But then, the path dissapeared and was replaced by a boggy slog. On a flatish bit we found some ruins and then had to cross Shesgnan Burn (more about river crossing later). We found the path again on the side of Meall Clach a Cheannaiche but only short sections were ridable before a pile of rocks or a bog forced us to push. Despite the physical challenges, the views of the Creag Meagaidh massif, the open moorland and Loch Spey were great. 5) before finally crossing with Magda's bike. I don't hold a grudge because Magda had packed a spare pair of socks for me. From Luib Chonnal we followed a good track beside the River Roy. The undulating route is surrounded by attractive peaks and we got a good look at the Falls of Roy. At Brae Roy Lodge we picked up a paved road and continued along Glen Roy. At a car park/viewpoint on the road there is an explaination of the Parallel Roads of Glen Roy. These look like tracks that run along contour lines along the steep sides of the valley. The Gaelic explaination is that they were built by Fingal a mythic giant hunter. Science unromantically puts them down to shorelines of ancient ice-dammed lochs that flooded the entire glen whilst an ice-sheet decayed at the end of the last ice age. From Roybridge back to the car was rather unpleasant cycling along a fast A-road in the rain.